In 2016, the National Institute for Health and Care Excellence (NICE) released guidelines recommending people with asymptomatic advanced follicular low grade lymphoma should be offered rituximab monotherapy treatment upfront at diagnosis (NICE 2016). Traditionally asymptomatic patients were not treated upfront but were put on active surveillance, known as ‘watch and wait’, and only offered treatment once they reached disease progression (Mcnamara 2012). This ‘watch and wait’ period could stretch to as long as ten years or longer (Rosenberg 1985, Ardeshna et al 2003, Advani et al 2004). Being diagnosed with a cancer and then not offered active treatment can be a relief but it has also been shown to cause anxiety (Latini 2007, Wagner et al 2015, Tompa 2016). 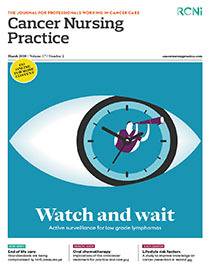 Haematology clinicians had become well versed at explaining why a ‘watch and wait’ approach for low grade lymphomas was a better option than treating them upfront with chemotherapy. The new NICE guidelines’ shift in focus away from a surveillance approach has had a big impact on current practice. Guidelines, however, are statements that have been developed to assist clinicians in decision-making; they are not rules (Samanta et al 2003). This article explores the evidence that guided the NICE review while also examining why active surveillance may still be a valid approach.